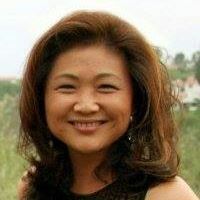 Jessica Ching, a long-time T1 and a whiz at all new D technology offered our adult T1 community as well as her Berkeley (CA) adult T1 group to participate in The Afrezza Challenge. Sounded like fun and we could eat, indeed we were encouraged to eat a high carb breakfast! Here’s Jessica’s report on the Afrezza Challenge and the results. 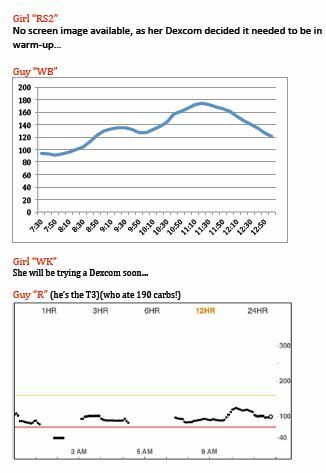 A series of experiences and observations led a small group of T1s to an Afrezza inhaled insulin challenge. The background: a coupe of us use a self-built Closed Loop Artificial Pancreas. However even with this amazing technology, T1 diabetes can still be a struggle. The reason? Insulin just works too slow and is often the weak link in diabetes management. It takes around 90 minutes for Humalog/Novolog to hit peak strength, so it’s rare that food timing and insulin timing ever match. As we know, that means blood sugars go high after eating. And if you take a large dose of insulin up front or in advance, it is likely to drive you low in a couple of hours. If you haven’t tried it, inhaled insulin is amazing. Afrezza is available from Mannkind Corp. It’s the company whose heaven-sent founder (the late Al Mann) also created the Minimed insulin pump. I think they are equally revolutionary. Afrezza is human insulin (just like Humalog/Novolog) but in a powder form. It comes in a pre-measured little cartridge and you take it by puffing it through a small “whistle.” It starts to peak in around 20 minutes, which means that pasta dinners, donuts, desserts and other carbs can be eaten with much less penalty— not counting the “fatness” penalty from eating so many carbs! But sometimes you just gotta do it; I use Afrezza on an occasional basis for higher carb meals/food, and for some corrections. 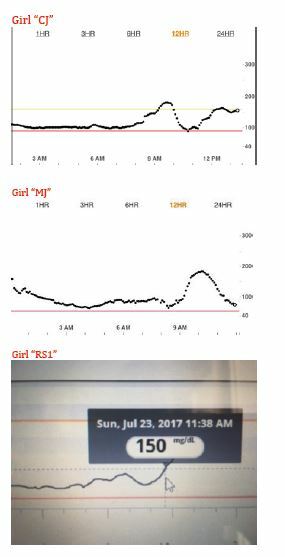 After some experiments like Examples 1 & 2, a group of us got together recently to compare out BGs using Afrezza. Six of us T1 girls met at a bakery cafe (plus a “T3″ spouse who was the non-diabetic comparison). Sunday morning cafe treats included a gluttonous assortment of pastries, muffins, bagels, oatmeal, and Belgian waffles. Some took it to the limit and added a mocha to wash down the carbs. No yucky sugar-free stuff; this was 100% the real deal. We ate. We inhaled. We were happy. Here’s a summary table of results! Overall results were very good, with a lot of desirable “green zone” readings and an average peak of 171 mg/dL. This is notable because it would be hard to max out eating bakery food at only 171 mg/dL on Novo/Humalog without a low several hours later. (Afrezza has no ‘tail’ as it’s a short duration of insulin). The most successful T1 did as well as the non-diabetic control guy! How awesome is that?? Our challenge really highlights the value of having inhaled insulin on hand for a high carb meal (or a correction, with very quick results). Hope you all get the chance to try it and maybe even keep it in your diabetes tool kit. As you can see from my examples 1 & 2, you may get even better Afrezza results with practice. Jessica – that was awesome information, thanks! I have a couple of questions. 1. You said you are using afrezza for corrections. Do you think it would be a good primary meal time insulin? 2. You said Afrezza is human insulin (just like Humalog/Novolog) but in a powder form. I was under the impression Humalog and Novolog were genetically engineered analog molecules and pretty different from the human insulin molecule. If afrezza is actually human insulin wouldn’t it be a much more natural option? Do you think that is why it profiles like natural insulin released by the pancreas? I’ve been using Afrezza for the past 2 years, mostly for corrections … and it works perfectly for that! 1. Recently I’ve been trying to use it for mealtime boluses. But for me, the 4 unit cartridge is usually too much for my low carb meals. I keep hoping they coming out with a 2 unit cartridge, which would deliver about 1 unit of novolog/humalog. 2. I’ll defer this to Jessica and Hunter, my local rep. The reason why Afrezza profiles like the a physiologic pancreas is all about the absorption. The reason why Afrezza is absorbed so quickly is because it is inhaled into the Alveoli, which is a thin vascular service in our lungs. Another reason why Afrezza is absorbed quickly is because our insulin compound is Monomeric, where Novolog/Humalog are Hexameric. Insulin is produced and stored in the body as a hexamer (a unit of six insulin molecules), while the active form is the monomer. The hexamer is an inactive form with long-term stability, which serves as a way to keep the highly reactive insulin protected, yet readily available. The hexamer-monomer conversion is one of the central aspects of insulin formulations for injection. The hexamer is far more stable than the monomer, which is desirable for practical reasons; however, the monomer is a much faster-reacting drug because diffusion rate is inversely related to particle size. A fast-reacting drug means insulin injections do not have to precede mealtimes by hours, which in turn gives people with diabetes more flexibility in their daily schedules. I am not sure if you use Facebook or Twitter because you can find a growing community of T1D and T2D using afrezza. 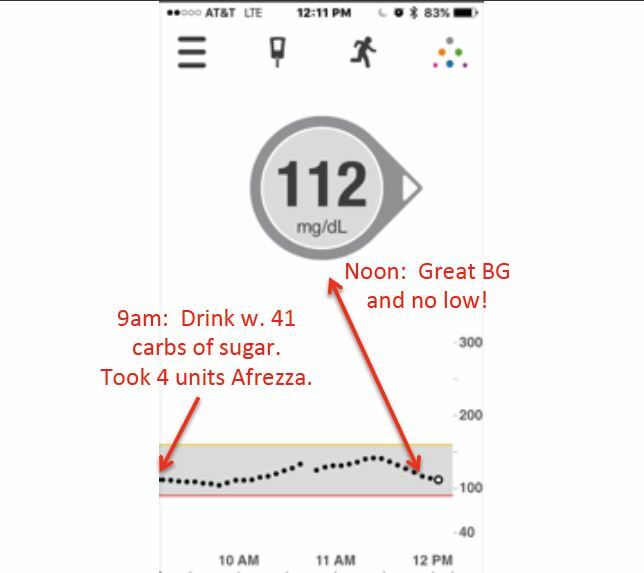 The vast majority of afrezza users use it as the primary meal time insulin. Afrezza is human insulin and it is not an analog like humolog or other RAA. Check out http://www.afrezza.com. Also check out http://www.afrezzajustbreathe.com and http://www.afrezzauser.com which is are affiliated with Mannkind the maker of afrezza. Thanks Eddie … some great links. The key difference is that Afrezza’s human active monomeric (singular) insulin is stabilized on a technosphere which is a known inert nano particle. The pancreas’s also has active monomeric human insulin . No other insulin in the world is monomeric. Other insulins are Hexomeric and inactive. Thus when you inhale the Afrezza the technospheres deliver to the deep lung where they melt at the lungs ph7 balance delivering those active monomeric human insulin molecules through the 1 cell thick lung wall systemically. The release is less then 30 seconds difference between the healthy pancreas and Afrezza so it mimics the healthy individual. Those other insulins are no matter how delivered are still hexomeric and inactive thus the body must eat through what binds them together as a six pack to get them to be singular. This time delay basically makes them to slow going in and getting out. At least this is my understanding as to why Afrezza’s kinetic profile looks like the healthy individuals and a significantly less hypo risk. Wow, Alfred, quite a thorough answer … thank you. Are you a user? I have studied technosphere and Afrezza for many years followed the clinicals. Seen things on Afrezza for example; Words from leading key opinion leaders saying, it’s obvoius Afrezza halts progression of the disease. Seen, zero hypo’s in all cases in a zero carb study where type 2’s are nothing and took Afrezza. Seen superior glucose results, 40%+ less hypos when used with a basil. More time in rangen no carb counting, or daily titration, weight neutral, no site scaring, oh, and no shot. 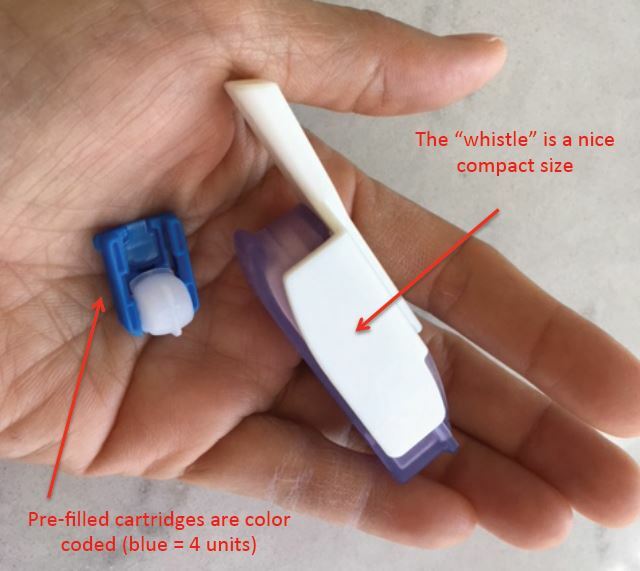 If you have a question while doctors are learning what this is check out VDEX for some pretty interesting slides that make it real clear how Afrezza mimics the healthy individual without the tail. I am mot associated with VDEX but here is the link. Hi George, I’ve used Afrezza for corrections and for meal boluses. I also use (liquid) insulin, so I try not to have too much on board when adding Afrezza. Thanks for reading about our challenge! I got a free sample. I’m using to correct highs and if I can’t exercise after breakfast. Works wonderfully…ex. I like to bike at a place a hour and half car ride away. Hard to eat breakfast before I leave and not be in the 200 when I get there. Afrezza to the rescue… keeps me in low 100’s, then it’s gone. I start my ride and may have a snack or nothing at all depending on CGM. Instead of 200 at start of ride, go low 10miles in, snack, back up or not, eat more, then too high for a nice lunch. I love this option. I know, right?!?!?! Excellent option! Keep pedaling!